Important note - Navigate it with the links which brings you to different contents. Beware that nothing must go out of iclassed.com domain. Enjoy and stay safe! 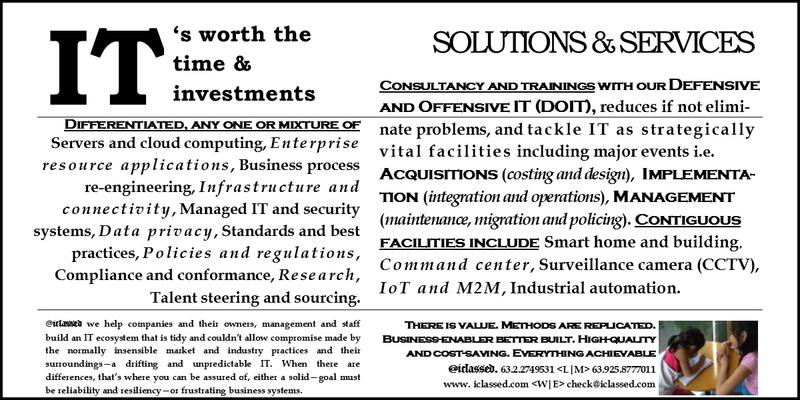 We strive for the best-in-class IT solutions and services. No ifs and buts. Looking for IT consulting service with a better-way attitude to do things? Or training program to learn the potent approaches for, and apply, IT based on your needs? Or both, but first, want to experience real world firsthand abilities? Do you need to address the business and regulations’ thrusts and demands with IT? IT practitioners, entrepreneurs, senior management, teachers, professionals and willing individuals interested? Sure, let's get to it. Everyone is welcome to take our DOIT program. For 2 decades, with a no slack off industry testing and improvement, we’ve proven it to be beneficial regardless of organizational size and applicability. Consider into account the relationships of working and learning. These are two different realities. Hence, their complementarity must be managed and improved accordingly. After training, a commitment and proper guidance might be necessary while taking the necessary steps to achieve the mark of a productive output. Our kind of IT consulting and training, we can appease whatever gap there is. Its most effective consequence, either done individually or a team player, will only matter to the business. Its owners or our clients, first and foremost. They know better when milestones or goals are being attained or not. IT is a decision makers dilemma, with DOIT program, your business anchors are better here. IT can be made an effective and efficient business and social facilities. It can be made automatic and more for humans, not machines. Build great machines for humans' greatest. Don't be a cynic now. You have to see it. 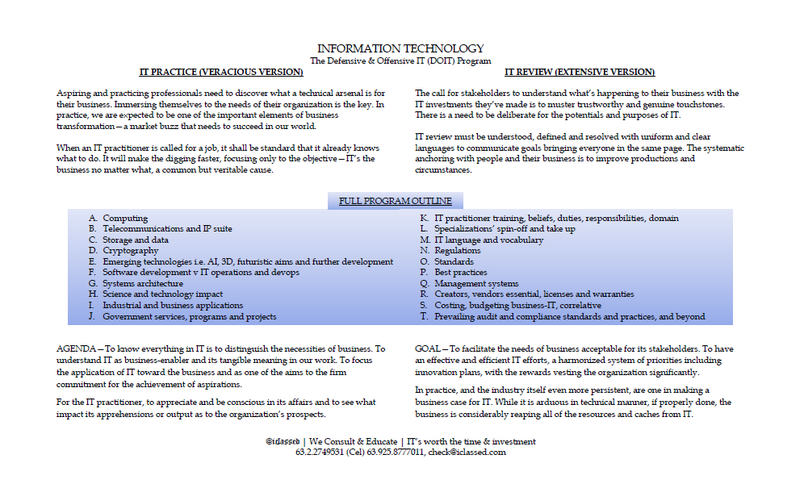 The defensive and offensive IT program was designed and made by IT practitioners for everyone. ©2009-2019 iclassed. All rights reserved. Technical facilities & resources from Manila. Basic service contract & related disclosures.